"Kaylin Ransom, 22, was ordered by a court to serve her 90-day jail sentence on the weekends. She makes the most of her time, though, treating her booking photo as a glamour shot." Kaylin Ransom is no celeb, but her mug shot might be the most fascinating of all. The 22-year-old Ocala, Florida resident is under a plea deal for felony battery and child abuse that forces her to spend each weekend behind bars at Lake County Jail -- and when she checks in every Friday afternoon, Ransom has to take a new mug shot. Here's the kicker: she preps for her weekly pic by getting her hair, nails and makeup done, in a major, major way. 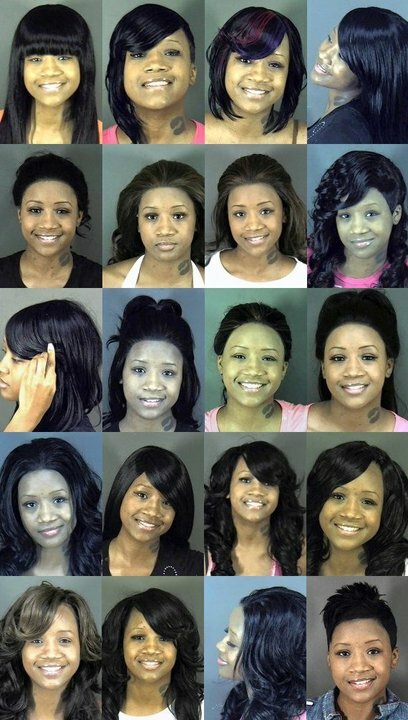 In her 28 mug shots, she sports a variety of elaborate lacefront wigs, extensions, false lashes and a Sephora-worthy array of lipgloss shades. Now, we're all about looking our fiercest in pictures, but this is truly out of control! Check out Kaylin Ransom's glamour shots -- hold on, mug shots -- and let us know what you think.